Seattle boasts several well-known icons, such as the Space Needle, Pike Place Market, and simultaneous views of the city skyline and snow-capped mountains from the ferry boats. It also has lesser-known treasures such as dim sum at Jade Garden, multiple places to fill your growler with local microbrew (including some branches of a local drug store chain), and Zebra Hunt. Be at peace, animal lovers, Zebra Hunt does not involve the hunting of zebras. It is a trio of musicians that have the same love of jangling garage bands such as The Feelies, The Clean, The Chills and the Woollen Kits as all of us on the senior editorial staff of WYMA. They can be distinguished from us, however, by virtue of the happy (for them) fact that they can write and play great songs. From the opening notes of "Delaware" City Sighs envelopes you in warm, jangling guitar tones, thick bouncing basslines and crisp percussion. The band has an excellent feel for the kind of upbeat garage pop tunes that dominate this album, and despite their love of Dunedin bands of the '80s the rumbling, muscular tones make this album sound distinctly American to my ears (e.g. stream "Call It Off" or "Already There" at the Bandcamp links). 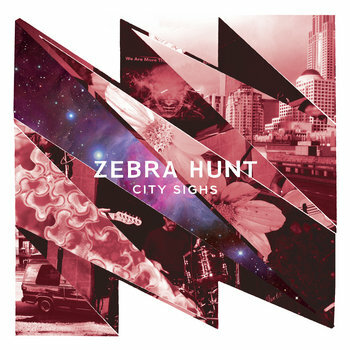 While the pace generally is brisk, Zebra Hunt proves equally adept when they slow it down, as on the affecting "Memphis" and "Always", or delve into psychedelia as on "Beaches of LA". My favorites include the previously released "Half Right", the aforementioned "Always" and the brilliant closer "Haze of Youth" -- five minutes and thirty-eight seconds of bliss. I love the songs, the tone and the range of City Sighs. But more than that, I like that this album seems to reveal a certain ambition. Unless you live in Seattle or read posts about Zebra Hunt by one of us writers fortunate enough to have been exposed to their music, you likely haven't heard their music. But the band's response isn't to start small with their first LP and mine a narrow channel such as jangle pop or dusty California guitar pop. Rather, they dare to be a rock band that can jangle, get your feet moving, make you sigh and pump your fist. Check out the streams below and if you think I may be right, go to one of the links and stream this album a couple of times. I can't think of a better start to your week that doesn't involve being naked (although you are allowed to listen to City Sighs sans clothes, just don't send us pictures). Zebra Hunt is Erik, Mitch and Robert.